We celebrated Aleli Parlor's 120th birthday in style with a luncheon and an official visit by our Grand President Cynthia Connelly of Annie K. Bidwell Parlor No. 168-Chico. This was a joint official visit with Junipero Parlor No. 141-Monterey. They will be celebrating their 115th birthday this coming December. Between the two parlors, we have 235 years of service to our order. The theme of the event was History of our Parlors & Pioneering Women of Monterey County. 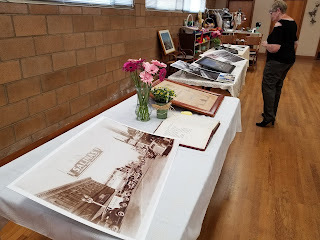 We had displays of historic photos from Salinas and Monterey as well as memorabilia from our parlors. Our luncheon was prepared by "A Sweet Affair"--a woman-owned business in Salinas. The menu consisted of Chicken Alfredo with Penne Pasta, Caesar salad, roll and butter and lemon cake with fresh berries and whipped cream. The event was attended by Grand Officers Dawn Dunlap, Grand Marshall from El Pinel Parlor No. 163-Cambria, Nickie Acevedo, Grand Secretary from Charter Oak Parlor No. 292-Visalia, Stephanie Kerr, Grand Trustee from Oakdale No. 125-Oakdale, and Marjorie McKisson, Grand Inside Sentinel from Sutter Parlor No. 111-Sacramento. Past Grand Presidents Linda Galassi from San Jose Parlor No. 81-San Jose, Sharon Johnston from San Juan Bautista Parlor No. 179-San Juan Bautista, and Sharon Logan from San Jose Parlor No. 81-San Jose also attended. Grand President Cynthia presented a 50-year pin for member Bernice Grigsby who lives in Montana. 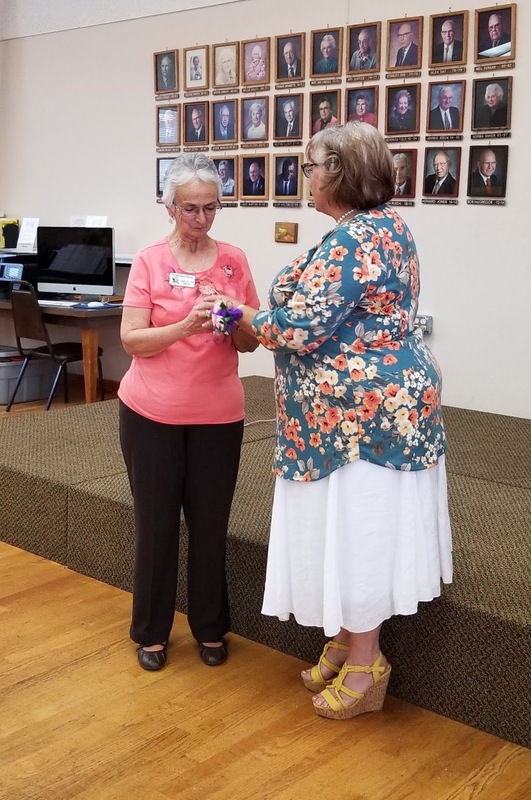 Aleli Parlor Secretary Rosemary Perez accepted the pin on Bernice's behalf. The proceeds from the coin march will benefit the Native Daughters of the Golden West Education and Scholarship Committee's effort to fund college and graduate school scholarships.